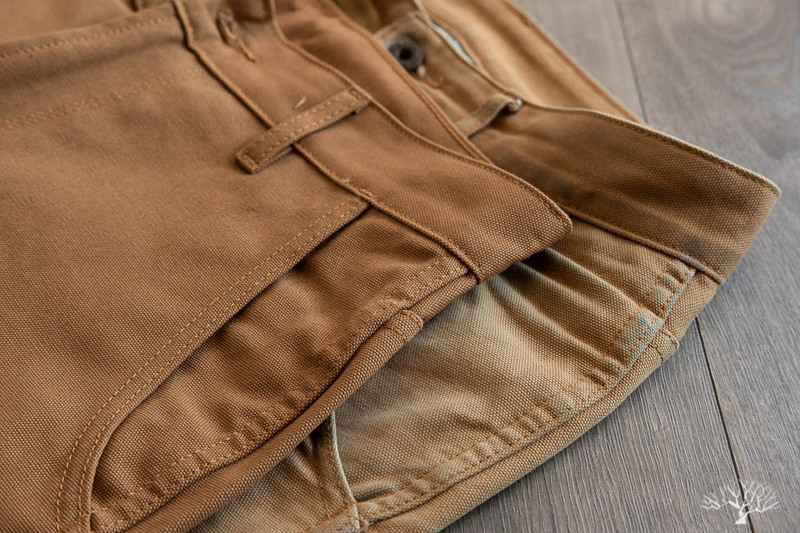 The Railcar Fine Goods Camel Flight Trouser continues to be our favorite pair of pants (sans-denim), and for good reason. Durable, versatile, and easy to pair with other things. Spend any amount of time on The Shade or on Withered Fig and you’ll see these trousers pop up in many photos. 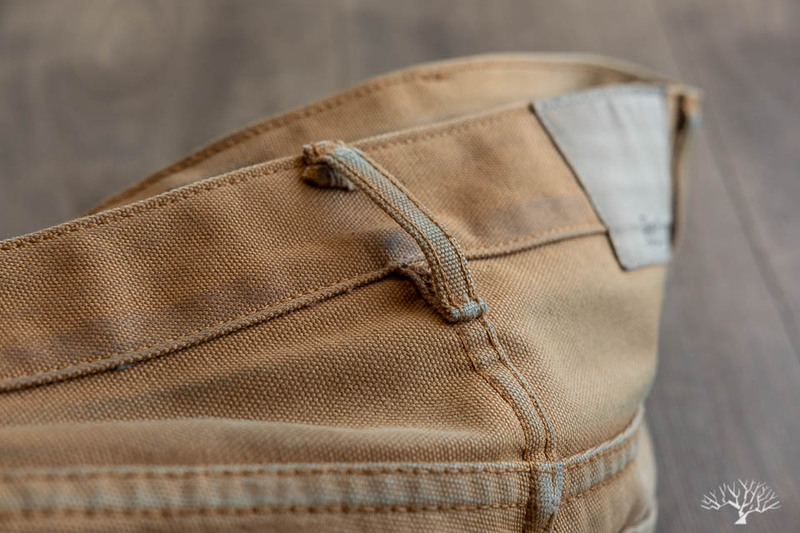 We cap off this two-part review of the Railcar Camel Flight Trousers with an update at approximately 30 months, and with some new information on washing and shrinkage – something that was missing from our first 16-month review. 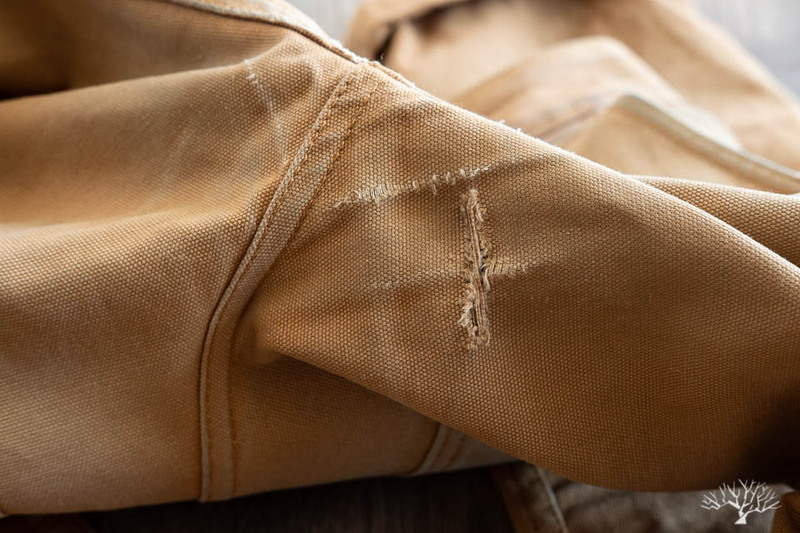 We highlight these garments in our Worn Series to show how these humbly made pieces wear over time – so you have something to look forward to, but also to help you on your decision (sizing, styling, etc.). With most of what I’d want to say for an Intro already laid out in the prior review, I’ll just add a few words here. 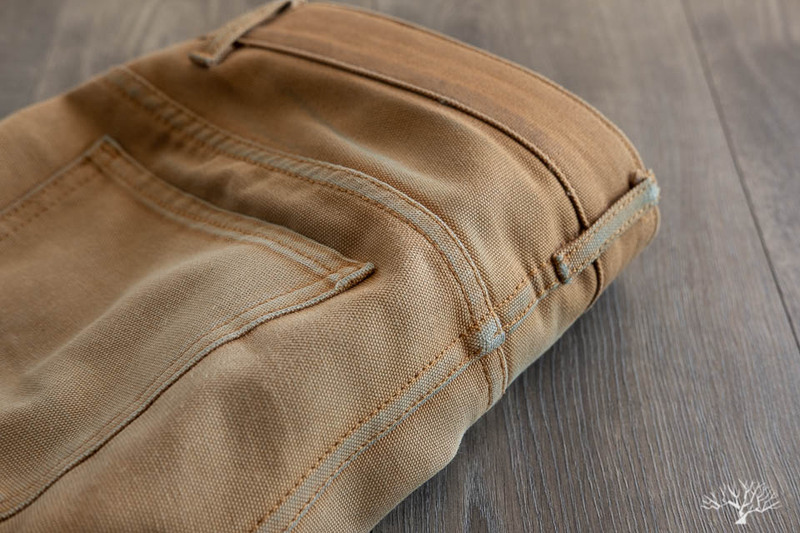 The Railcar Fine Goods Camel Flight Trouser simply cannot be beat for it’s value proposition and the return on investment you get in this piece. 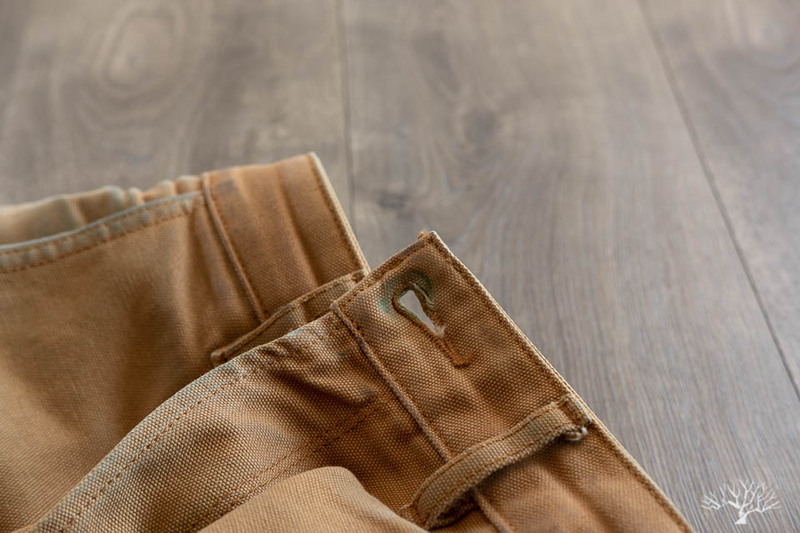 It truly is a year-round pair, great for the colder months with it’s tighter-weave canvas fabric, but also just as good for the summer months when you roll up the cuffs a bit and let your ankles breathe. Pair them with your favorite 145 Oxford and you’re all set. That said, for this review I provide a general update on how it’s been over the last year, as well as new information on washing, shrinkage, and sizing in general. A couple noticeable changes happened in the last year-plus with these pants. Of course, you have the continual fading of the fabric with the pants continuing to lighten. They are almost a very light tan in certain lighting, a stark contrast from its original bold and deep burnt orange color. 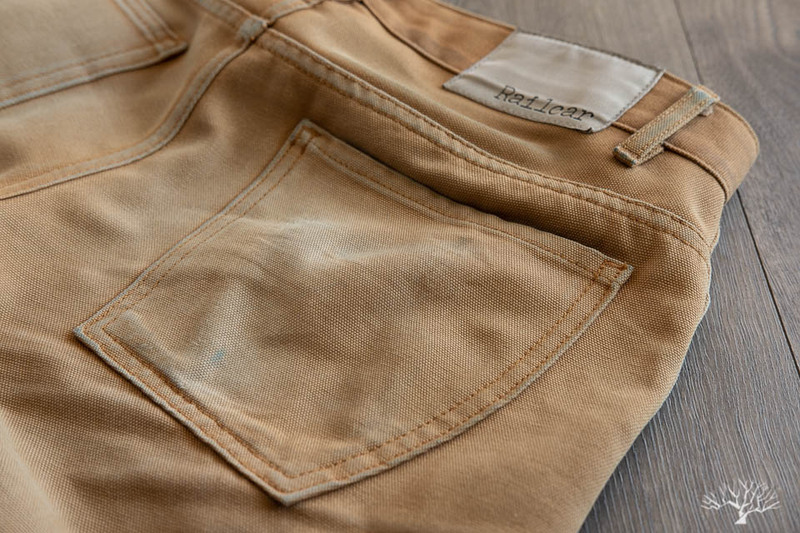 The high-wear areas such as the knees and the areas around the pockets are the lightest, but even the overall shade of the trousers are much lighter than before. Aside from the color, the fabric has also softened up substantially. In general, this is a welcome feeling as it just becomes more comfortable. Running your hands over the original pair in its virgin state definitely leaves you feeling like it’s a piece of canvas fabric that has been crafted into a pair of pants. However, running my hands over this 30-month old pair definitely makes me feel like these are a pair of pants that happen to be made out of canvas fabric. A subtle distinction, but one that speaks to how your garments wear over time and come into fruition. Now what happens when an area wears down too much? The areas with high-wear have started to fray, with the dense weave of the duck canvas splitting and starting to create integrity issues. Once the fabric has worn to where the weave has started to loosen, it’s likely that a blowout will be coming soon to a theater near you. 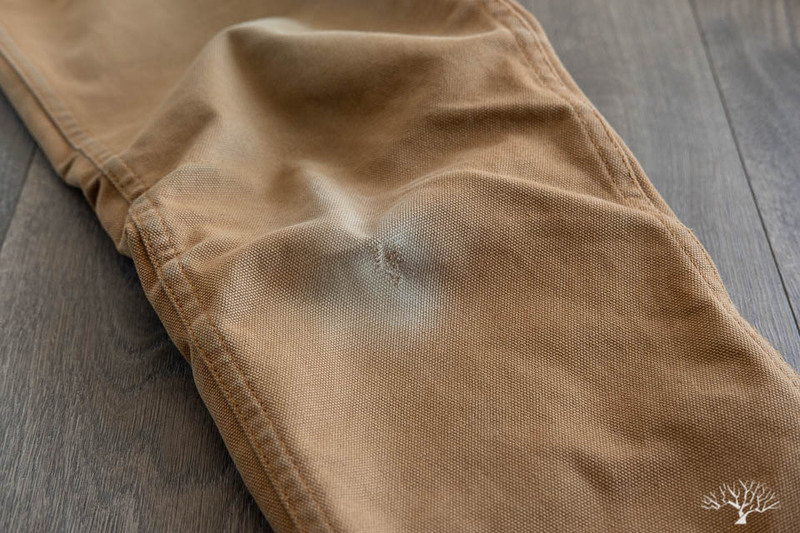 But in all seriousness, with the amount of wear that I’ve put on this pair over the last two-plus years, it’s pretty significant that I only got my inner-thigh blowout at this 30-month mark. So 30-months. Yes, these were not worn every single day for 30-months. But I will say that I probably averaged between 2-4 days in these each week. 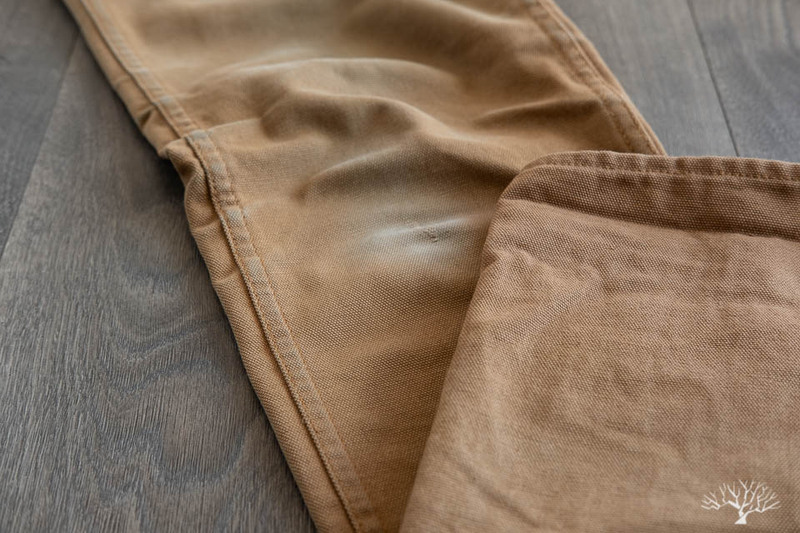 Because these came in the canvas fabric – tighter weave, more durable, more protection – I tended to wear these for times such as working on the car, outdoor chores, and any other thing that I might rough up the pants or get them significantly dirty. I tend to avoid doing that with denim just because I personally don’t like non-standard fades such as if I scraped my knees on the ground, which would create some skid-fades. But certainly this is no knock on medium-to-heavyweight denim and their ability to withstand the same rigors of life. Given that I wear a lot of indigo-dyed clothing, you’ll see a lot of indigo crocking throughout the waist and upper block area. Most noticeably is probably the areas around the pockets and the belt loops. 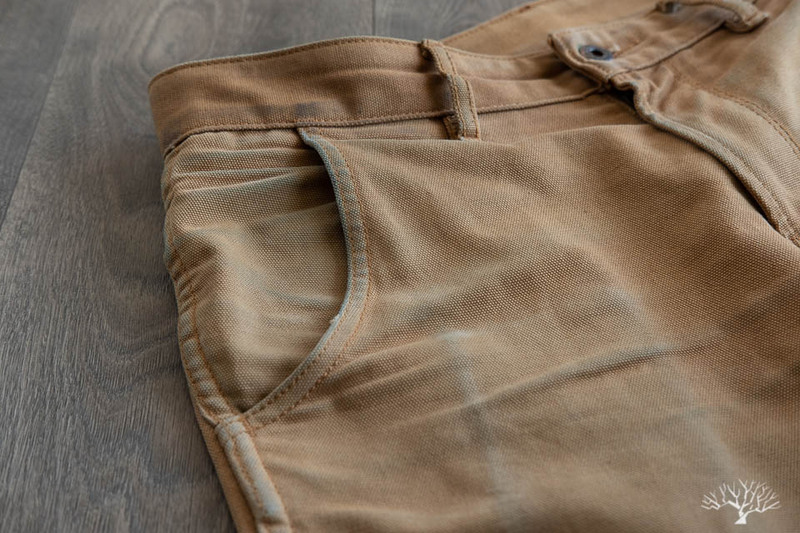 These indigo stains are a small detail, but also one of my favorite parts of how the trousers have worn in. There also appears to be some greenish cast around the waist button hole, which I think is created by the copper button. I’m no chemist, but perhaps something to do with the copper rusting a bit, oxidizing with the elements, and turning green on the underside, which then rubs off on the canvas fabric. Sounds good enough! While I will get into the washing and shrinkage more below, I will say that they did shrink just a little and I tended to put a lot of stress on the fabric after the wash. Post-wash, I found that whenever I wore them I tended to push down on the pants with my hands in my pockets to create more space, and also tried to stretch out the crotch and inner-thigh a bit by doing some wide-legged stretching. So some of the wear and tear on these pants might have been pre-mature due to the fit being tighter than ideal for me. However, I still loved the overall fit, just wish I had a .25 inch more room in the thighs and waist. As you can see, there was moderate shrinkage of about 0.25″ in both the thigh and waist after the wash, and then wearing them back in for a couple hours. Keep in mind that this was a cold wash and not warm/hot, which would likely shrink the pair even more. Hopefully this provides some useful information as far as sizing goes. 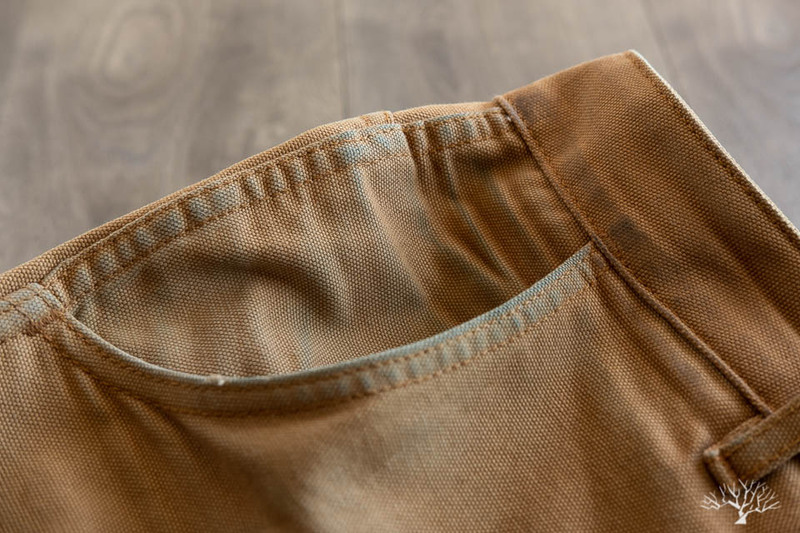 If the your Flight Trousers feel a tad tight right out the gate, you may want to size up instead and opt for a cold or warm soak to bring your pair back down to a slimmer fit, rather than trying go with the slimmer pair and hoping it stretches a lot. The wash also frayed some of the loose threads around the blow-out area a little more, revealing my need for a repair ASAP. With the inner-thigh blow-out, I’ve already sent them back to Steven @ Railcar for a repair. We’ll see what it comes back as. Perhaps I’ll do another post on the repair and how it’s worn after another six months to a year. 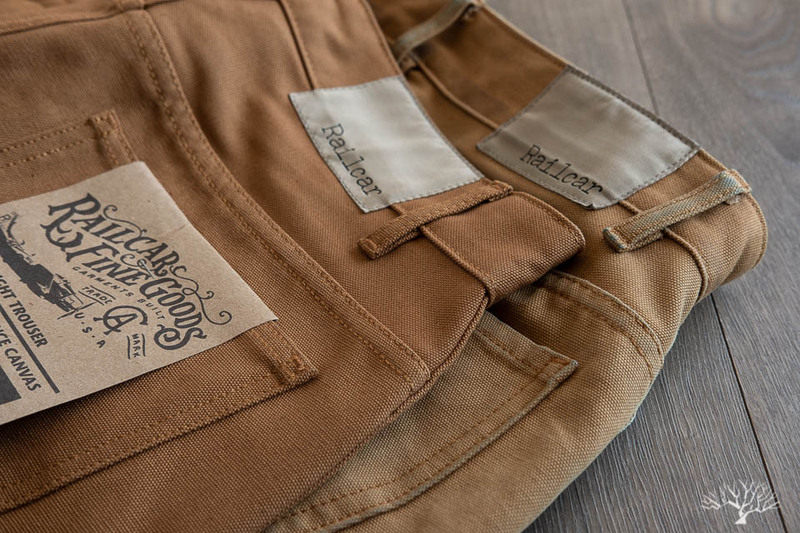 In any case, one of the best things about Railcar is that no matter where you purchase your Railcar denim/pants (i.e. 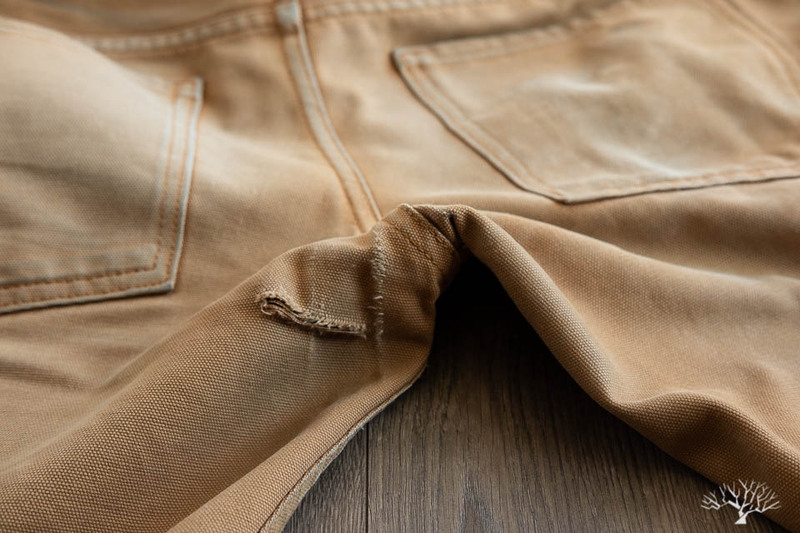 from Withered Fig), you can receive 25% off denim services (hemming, tapering, repair, etc.) when you send it back to them. I’ve had one other pair of denim repaired and the break-in is pretty tough and stiff with all the new thread being re-woven in. I’ll be curious how Steven does it and look forward to seeing the results. As always, feel free to message us on IG or e-mail (to make sure we see it) if you have questions on sizing. And just for good measure, I’ve included a couple photos at the bottom, of some brand new trousers next to my worn in (30 month) pair. The Railcar Fine Goods Camel Flight Trousers and Olive Flight Trousers are available on our web store. If you don’t see your size in stock, e-mail us for an estimate on the next restock.